Feeling a little unfocused and unmotivated lately? Are you suffering from information overload which is causing distraction and less focus? Do you want to get more done while staying focused and motivated? So How Can You Take More Action While Staying Focused and Motivated? Anyone can come up with a goal, but not everyone has the ability to achieve it. For that to happen, you need to take action first. Goals are not like dreams or prayers. You cannot just close your eyes and wish for it to happen. You have to do something. Certainly, taking the first step toward reaching your goal is the most crucial but it is not the only thing you have to do. There are a lot more steps to take and work hard on, and for that you need to be focused. This is the worst obstacle of all because how do you ignore something that lives inside your mind or heart? This is when motivation kicks in. As the old adage goes, when the going gets tough, the going gets tougher. Goals are like a destination that you have to reach. Taking action is what gives you direction toward your goal. Staying focused ensures that you are always on the right path. And lastly, motivation is what makes sure that you will do anything and everything to reach the end of the path, arrive at your destination, and achieve your goal. This is a never ending and rather flexible cycle. At times, you will need to motivate yourself in order to take action. Other times, you need to take action to stay focused. In any case, which goes first does not matter so do not be surprised if you find yourself jumping from one tip to another. What matters is that you are taking all the positive steps toward reaching your goal. 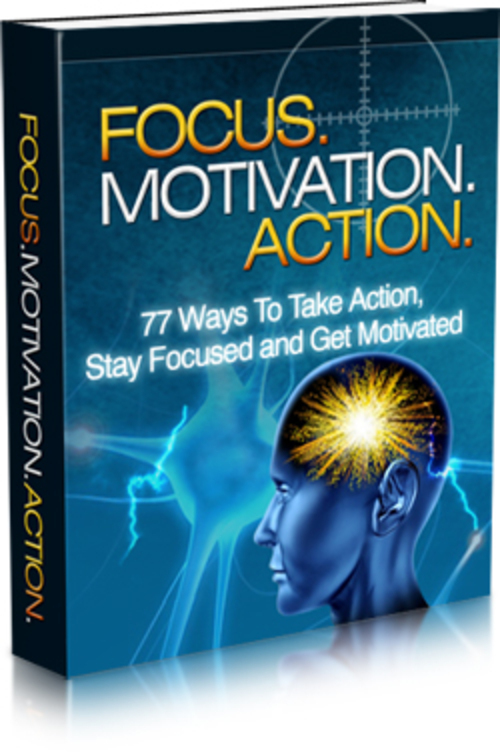 In this downloadable book, I've covered the 77 powerful ways to help you take action, stay focused and get motivated! How everything starts with the mind first. Before you "get" you must "do" and "feel". How to set a schedule for your projects and work so you can manage your time more effectively and of course, spend more time doing the things you love! How to maximize your time so you can get the most important done, first. The power of a gratitude journal and why you should have one. They say if you're not grateful for what you already have, you can't get any more. Learn to be grateful first and you will attract a ton more! How perfectionism kills. Things don't need to be perfect, and how you can detach yourself from perfectionism. Does that sound amazing or what?